e-mail spam is a serious problem for anyone whose e-mail address is prominently in the public domain, and as i ply the daily grind in the offices of a newspaper, the sheer amount of junk mail has reached horrendous proportions. the practised eye gradually garners the ability to pick out the relevant from the crap, but only last week an e-mail arrived purporting to recruit a mystery shopper for an assignation on islay. after a few exploratory replies, the veracity of their requirement was proven, but i felt it my duty to point out that the population of islay is only marginally above 3,000 and we all know each other, therefore the notion that someone might assume the mantle of mystery shopper was, at best, a little disingenuous. i do seem to remember at least one or two follow-up e-mails intent on disparaging my controversial assertion, but i am now on the look out for a person wearing a false nose, glasses and a moustache, hidden behind a long overcoat, pretending to purchase something with which they would not normally be associated. there was a time when one could change into one's secret identity just prior to extricating the velocipede from the bike shed; with those three rear pockets, a peaked cap and helmet, surely cognition would be none to prevalent as i expertly negotiated the lack of village traffic and headed for the wide-open yonder. of course, the likelihood of a secret identity on a bright orange colnago motoring at speed through a village of a thousand people is delusion of considerable magnitude, but there's no denying that seen on a bicycle, my apparel would not be confused with everyday wear. well, at least that would have been the case several years ago. now however, i have more jerseys with pockets at the back for day to day wear than not, and i'm happy for that to be the case. i have, on more than one occasion, expressed a distinct preference for long-sleeves on my cycle jerseys; actually, long-sleeves on pretty much anything, come to that. having reviewed my attire for the last few weeks/months/years, i now realise that i wear cycle related tops pretty much everyday, and can't make up my mind whether that's a good thing, or merely demonstrates how narrow minded my outlook on life has become in the past few years. ever the optimist, i'd prefer to look upon this as a good thing, and the even gooder thing can be summarised by harth huffman of portland's wabi woolens. "one other thing i do notice though, is that i am always in a hurry to get out of my wet footgear and change pants, but for some reason - unless it is completely soaked - i am never in a hurry to get out of my wabi jersey.Ê it seems to warm with my body, keeping me comfortable and serving as a reminder of the weather and roads i just conquered.Ê if that sounds cheesy, i apologise, but it is very, very real." harth is the proprietor of wabi woolens, so you'd sort of expect him to say that, but on repeated wearing of my own wabi woolens jersey, i find that i can do little but concur. i'm sure if you own(ed) one too, you would be of similar mind. however, the original wabi jersey is of not insubstantial construction, and still the finest cycle jersey i own. 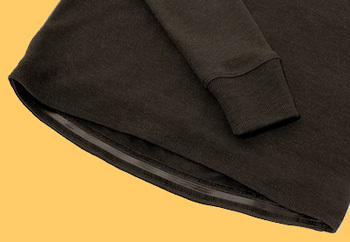 if it has a downside, it's that its cosiness errs perhaps too much on the toasty side; not that much of a problem under current weather conditions in the uk, but rather exempting it from year-round wear, even when you'd rather be wearing merino. 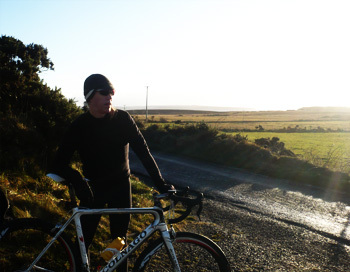 despite his comfort and joy in extended wearing of the original jersey, mr huffman is aware of the perceived need for a smidgeon of flexibility in the upper apparel department, realisation of which has resulted in the long-awaited long-sleeve sport series wabi woolens merino jersey. again, it seems far more practical to have harth introduce his sport series (also available in short sleeve format). 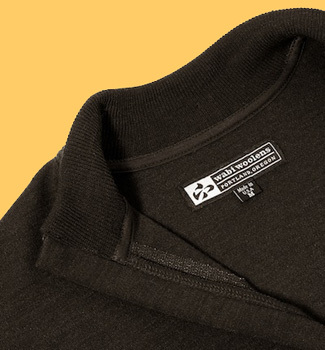 "the sport series is a lighter weight interlock wool that is machine washable.Ê the fit is athletic, which is to say a trimmer fit than the original wabi jersey, and aimed particularly at those wool lovers who like to keep the faith year-round." the notion of being able to test any product in temperatures alluded to above seems like a very welcome opportunity at present, but given that it is currently several degrees below, and has been over the past week or so, meant that a long sleeve, sport series jersey not only received a decent workout around the principality, but was a major factor in retaining enough comfort and warmth for a couple of long test rides over this past weekend. 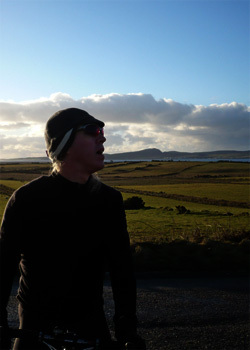 now i won't delude you into thinking that my secret identity is rough and tough enough to undertake four hour plus, sub-zero bike rides clad in a lightweight merino jersey, long-sleeves or not. i was, for a substantial portion of the foregoing, sheltered within a softshell jacket. another myth escapes into the ether. however, this softshell regression was entirely deliberate, because there are always going to be times when a jersey of even fortitude and reputation are simply not enough. merino is not renowned for its windproofing properties, though i must admit that the original wabi jersey has given cause for second thoughts on that score. the sport series jersey is luxury of a quality that comes along too few times in a lifetime. no matter harth's delight in remaining jerseyed after a ride, this is the jersey you wear for an hour or so before secrecy, simply because of a) how good it makes you look, and b) how fabulous a jersey it truly is. nothing that subsequently transpired over eight hours of cycling and probably around an hour in debbie's (over two days, i'll have you know) gave any cause to revise my initial thoughts. merino breathes, and it does so even while hidden under a fleecy softshell; swot and hetty are not table-mates over coffee, no matter the exertions of getting there. the sleeves are of commendable length, ending in ribbed cuffs which match the ribbed collar, a nice retro touch on a contemporary garment. the zip extends about half way down the jersey's front, allowing for flexibility of ventilation. there are three substantial pockets at the rear arranged in the recognised pattern, augmented by a fourth, zipped pocket on the outside of the middle one. the tail under the pockets drops lower than the front to protect the rear mid-section from spray, assuming you have not fitted a set of roadracers. this is held in place by some of that gloopy stuff that holds things in position so well. the fit is, if i have the terminology correct, of race comport; the physique becomes positively whippet-like if the mirror does not tell tales. 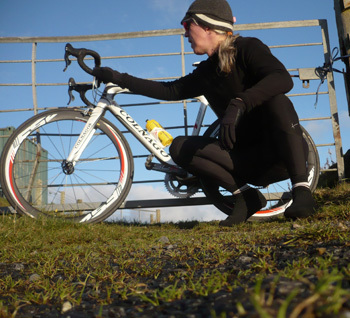 "the sport series should appeal to performance oriented cyclists who are accustomed to the fit of lycra but may be interested in the benefits and luxury of merino wool. to honor my michigan roots by paraphrasing henry ford, they are available in any color you want, so long as itÕs black." i described the original jersey as being the 'rolls royce of wool cycling jerseys, and the temptation is therefore to ascribe a more sports oriented vehicle to this particular variation, but i figure its coming of age makes comparisons unnecessary; this is the wabi woolens of wool cycling jerseys, eminently comfortable in its own skin. wabi woolens sport series jerseys are available in sizes small to xxxl. the short sleeve retails at $145 (£92), and the long-sleeve at $160 (£102). both are made in the usa, and available direct from the wabi woolens website.